Pam and Ray welcome you to their home, Ardlinnhe and look forward to offering their guests a warm and comfortable stay. We are conveniently situated close to Fort William town centre, just a ten minute leisurely stroll along the water front will take you to a range of bars, restaurants and shops. Ideally situated for skiing, climbing, cycling and walking. Ardlinnhe is a perfect base from which to discover all the wonders and beauty that the highlands have to offer. 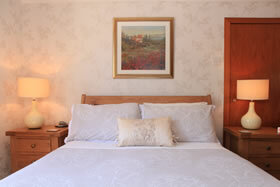 We offer 3 rooms, 2 double and 1 twin all have en suite facilities.